"The Valley's Most Neighborly Town"
Granada Hills is located at the foothills of the Santa Susana Mountains, north of North Hills, Northridge, west of Mission Hills and Sylmar, and east of the Porter Ranch neighborhoods of Los Angeles. The Ronald Reagan Freeway–Route 118 runs through its southern area. The neighborhood is ethnically diverse and includes whites, 55.5%; Latinos, 20.6%; Asians, 16.3%; blacks, 3.4%; and others, 4.2%. Korea (16.0%) and Mexico (13.8%) were the most common places of birth for 29.2% of the residents who were born abroad. The median yearly household income in 2008 was $83,911. Renters occupied 26.4% of the housing stock. The average household size of 2.9 people was considered average for Los Angeles. The percentages of married men (60.4%) and women (58.5%) were among the county's highest. There were 4,032 veterans, or 10.5% of the population, a high proportion compared to the rest of the city. 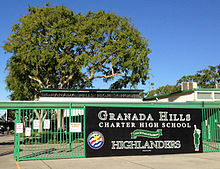 Granada Hills is composed mostly of Mid-Century modern architecture. Of note is the "Balboa Highlands" tract built by iconic developer Joseph Eichler as well as the Knollwood Country Club area and Knollwood Grove tract. Many of these homes, which are North of Rinaldi/West of Balboa, have been featured in movies, commercials, magazine pictorials and appear in books about Eichler or mid-century architecture. 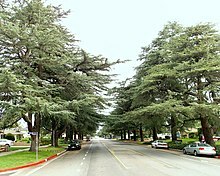 Deodar trees on White Oak Ave.
White Oak Avenue, between San Fernando Mission and San Jose Street was declared a Los Angeles Historic-Cultural Monument on August 3, 1966 for the 101 Deodar Cedar trees that line the street. The trees are native to the Himalayas and appreciated for their size, beauty and timber. White Oak Avenue trees was used as the back-drop in the flying bicycles scene in the 1982 film "E.T. the Extra-Terrestrial". 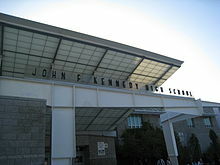 Granada Hills Charter High School's stadium, the John Elway Stadium (named after the quarterback, an alumnus), is the home of the Los Angeles Rampage women's soccer team and the former home of the San Fernando Valley Quakes. In 1963, the Granada Hills Little League won the Little League World Championship in baseball. O'Melveny Park, the second largest park in Los Angeles, consists of a large undeveloped area and a much smaller developed section with several dozen citrus trees, a small intermittent stream, and grass and picnic areas. This 672-acre (2.72 km2) park includes hiking trails and fire roads, including a grassy promontory from which a view of the northeastern portion of the San Fernando Valley may be seen. Mission Point and its environs are popular mountain biking and hiking areas. The view from the top of Mission Point (called "Mission Peak" by many residents), the highest point in Granada Hills, is striking, taking in most of the San Fernando Valley. In clear weather, one can see the Pacific Ocean and Downtown Los Angeles. The area around the peak is home to deer, golden eagle, bobcats, mountain lions, raccoons, and coyotes. The Granada Hills Recreation Center (also known as Petit Park) features an auditorium, baseball diamonds, basketball courts, children's play areas, a gym, picnic tables, tennis courts, classrooms, a dance room and a library. Programs are offered in sports, and arts and crafts. Zelzah Park, an unstaffed park, has a bridle path, a children's play area, and picnic tables. Los Angeles City Council District 12 encompasses Granada Hills, with councilmember Mitchell Englander serving..
Granada Hills North Neighborhood Council — Representing the area bounded by Los Angeles County line to the north, Aliso Canyon to the west (west of Zelzah), Interstate 5 and Interstate 405 to the east and California 118 to the south. Formed in fall, 2002. Granada Hills South Neighborhood Council — Representing the area bounded by California 118 to the north, Lindsey and Aliso Canyon to the west, Interstate 405 to the east and Devonshire Street to the south. 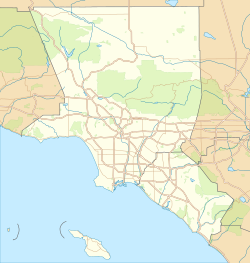 Granada Hills is in California's 30th congressional district as of 2013 and represented by Democrat Brad Sherman. It was in the 38th State Assembly district, and the 20th State Senate district until the 2014 redistricting. Thirty-two percent of Granada Hills residents aged 25 and older have earned a four-year degree by 2000, an average percentage for the city. Los Angeles Fire Department Stations 18 (Knollwood/Granada Hills) and 87 (Granada Hills) are in the area. Granada Hills is served by the Los Angeles Police Department Devonshire Community Police Station. The Los Angeles County Department of Health Services operates the Pacoima Health Center in Pacoima, serving Granada Hills. The United States Postal Service Granada Hills Post Office is located at 18039 Chatsworth Street. Los Angeles Public Library operates the Granada Hills Branch and is located in North Hills. Ashley Judd, actress, was born in Granada Hills. Jim Rodnunsky, technician, inventor of the Cablecam system. Frank Wilcox, actor and "honorary mayor" of Granada Hills in the 1960s. ^ "Granada Hills Chamber of Commerce". Granada Hills Chamber of Commerce. Retrieved September 6, 2012. ^ "Los Angeles Almanac: City of Los Angeles Population by Community & Race 2000 Census". Archived from the original on January 11, 2010. Retrieved April 5, 2010. 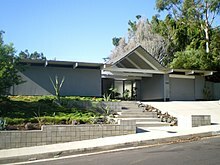 ^ "Eichler Homes of Balboa Highlands - Welcome". Balboa Highlands Neighborhood Website. Archived from the original on July 12, 2014. Retrieved July 3, 2014. ^ "No. 41 - 114 Deodar Trees". Big Orange Landmarks. 2007-07-04. Retrieved 2014-08-03. ^ "Little League Baseball: Past Champions". Littleleague.org. Retrieved January 25, 2011. ^ "The Quiet Majesty of O'Melveny Park". The Trust for Public Land. ^ "O'Melveny Park". Santa Monica Mountains Conservancy. ^ "Mission Point: Mission Point Trail". Trails.com. Retrieved July 24, 2010. ^ "Neon Way – Granada Hills – Los Angeles County". socalmtb.com. Retrieved July 24, 2010. ^ "Granada Hills Recreation Center". City of Los Angeles Department of Recreation and Parks. Retrieved July 24, 2010. ^ "Zelzah Park". City of Los Angeles Department of Recreation and Parks. Retrieved July 24, 2010. ^ "California's 30th Congressional District - Representatives & District Map - GovTrack.us". Retrieved April 1, 2013. ^ "Project Vote Smart information for 91344". Votesmart.org. Retrieved January 25, 2011. ^ "Citywide Division Map". Los Angeles Police Department. Retrieved March 7, 2010. ^ "Pacoima Health Center." Los Angeles County Department of Health Services. Retrieved on March 17, 2010. ^ "Post Office Location – GRANADA HILLS." United States Postal Service. Retrieved on December 6, 2008. ^ "Chao-Li Chi obituary". Los Angeles Times. 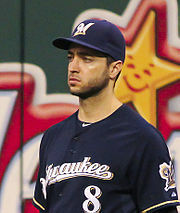 2010-10-24. ^ Reilly, Rick (May 10, 1983). "Elway's 'just one of the boys'". Eugene Register-Guard. (Denver Post). p. 1C. ^ EISENHAMMER, FRED, "NBA Finds It Hard to Get Gray Out", "Los Angeles Times", January 7, 1990. ^ Farmer, Sam (2011-06-16). 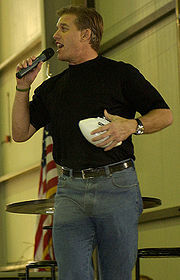 "Jim Rodnunsky dies at 54; developer of Cablecam system used in sporting events, Hollywood films". Variety. Retrieved 2011-07-05. ^ "Cablecam developer Jim Rodnunsky dies". Variety. 2011-06-16. Retrieved 2011-07-05. ^ "C.J. Sanders". UND.com. Retrieved July 29, 2016. 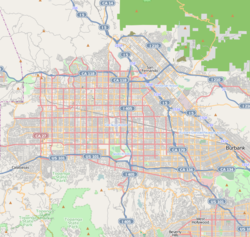 Wikimedia Commons has media related to Granada Hills, Los Angeles. This page was last edited on 25 February 2019, at 01:48 (UTC).